This has been a fun week of play and discovery. I hope you have enjoyed creating a somewhat whimsical reminder of the change of season with the quilted umbrella panel and then traipsing through your stash of scraps to find fabrics for the patchwork panel (I hope it was a fruitful search!) In yesterday’s post I quilted the patchwork panel using decorative stitches, called Handlook Stitches, built into the PFAFF quilt expression 720 remember there are over 400!! Today all that’s left is to put the cushion together! Let’s go! The rain is on its way and I’m starting to get in the mood to enjoy a few rainy days. 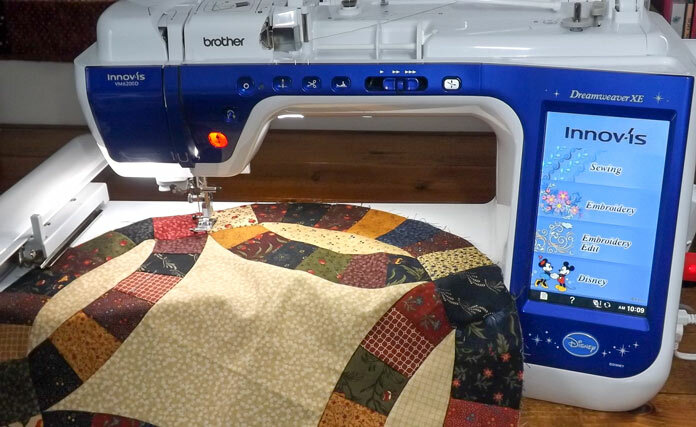 After all, it means a little more time to spend quilting before the garden needs tending and the outdoor summer adventures begin! This week I’ve been creating an ode to spring with a quilted umbrella cushion. In yesterday’s post, I sewed together a patchwork panel made of scrap fabrics, honoring Earth Day. I continue the adventure stitching out several decorative stitches using the PFAFF quilt expression 720. Spring cleaning is so popular this time of year and what better way to tidy your sewing room than to use up some stash! Plus, we’re still thinking about Earth Day and recycling next week and making something out of what we already have. 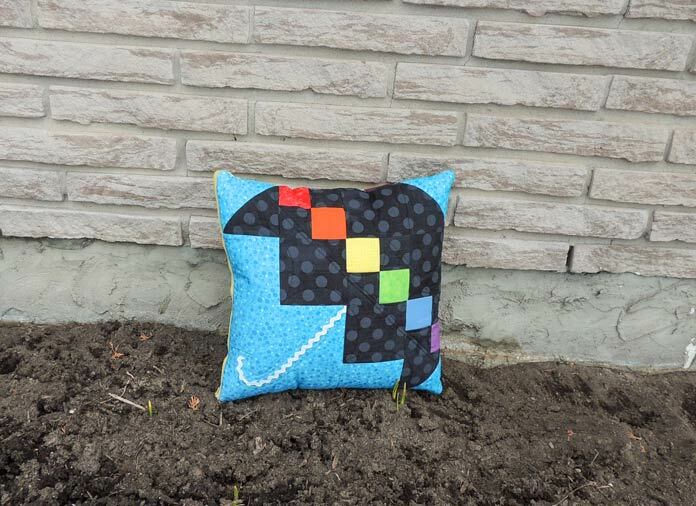 In yesterday’s post, I showed you how I quilted a large pieced umbrella block as the front of a cushion cover. Embracing the cheerful decorating possibilities that spring brings, this week I’m making a quilted umbrella cushion. In yesterday’s post, I cut and assembled the units to make the umbrella block using PFAFF quilt expression 720. 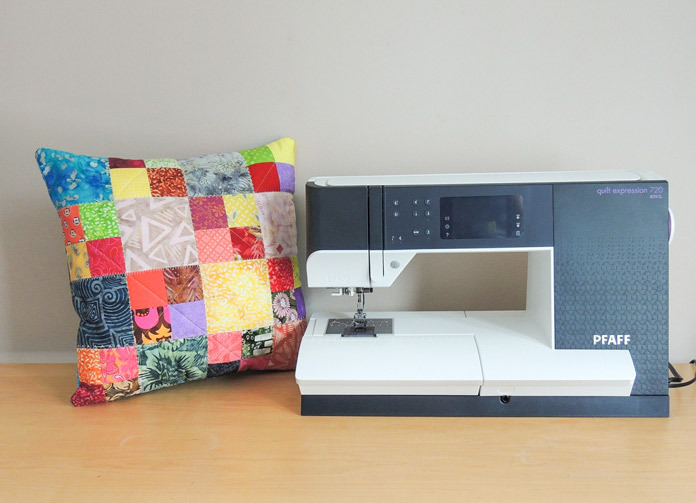 Today I’ll rely even more on the IDT system to easily add quilting to the front side of the cushion. To start, join the units of each row, then join the rows together. It feels like spring is taking a long time to arrive this year, at least where I live. I’m actually wishing for rain and thought making an umbrella themed cushion for the season might be just the thing to share this week! April showers do eventually arrive and it’s fun to make seasonally themed decor. 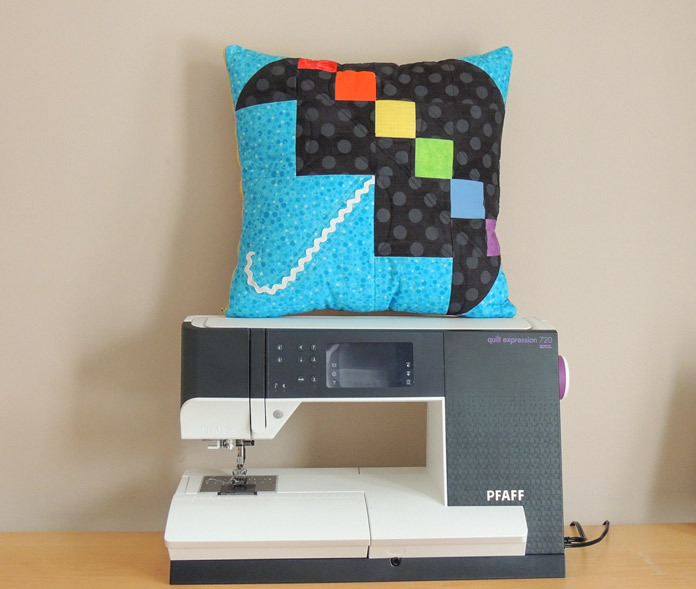 I used the PFAFF quilt expression 720 to help me stitch up this bright quilted cushion.